Color: intense bright dark cherry color with garnet rim. Nose: powerful, black fruits with nice toasty notes, spicy, creamy oak, complex and elegant. Taste: powerful, flavorful, toasty, round tannins, good acidity, fruity and spicy. Good backbone and lingering finish. Even for those who might only be minimally aware of Ribera del Duero wines, there’s a good chance you have come across Protos while staring at a wine store shelf or pondering the Spanish section of a restaurant’s wine list. Their history and pedigree make Protos the quintessence of Ribera. 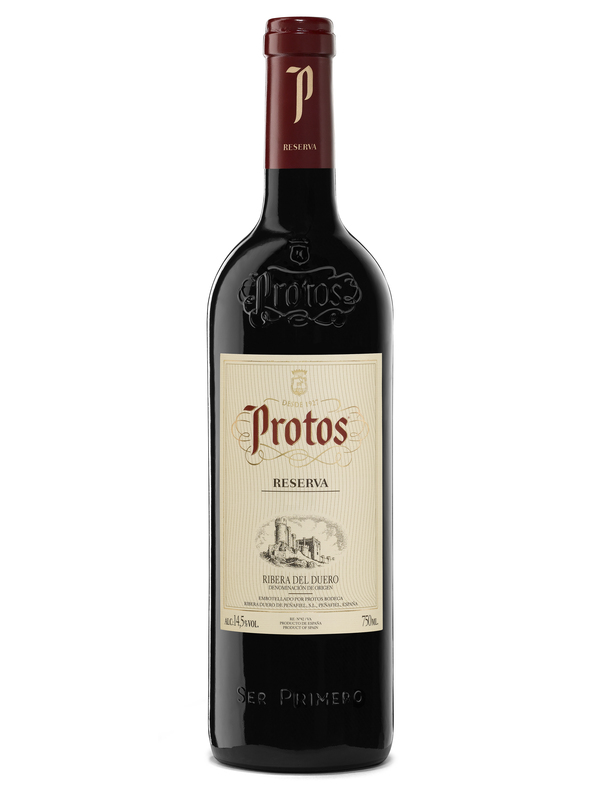 Bodegas Protos was founded in 1927 as the first in the Ribera del Duero region. Protos translates as âthe firstâ in Greek. Our success is based on our traditions combined with the best modern technology, from the 1.2 miles of corridors under Penafiel Castle - some dating from Middle Ages - to the new building designed by Sir Richard Rogers. Our complete wine portfolio includes Protos Crianza, Protos Seleccion, Protos Reserva, Protos Gran Reserva, Ribera Duero Tinto, Ribera Duero Rosado, and Protos Verdejo. Color: Ruby in color with a purple huge. Nose: Black fruit aromas well balanced with the oak, bringing sweet spicy and toasty notes. Taste: Good structure. It is tasty, sweet, well balanced, with pleasant smooth tannins and on the finish, toasty reminders.